With its fabulous location posh amenities and those signature beds the non-smoking Westin Mount Laurel is one of the most popular hotels among guests in the area. The seven-story 175-room hotel boasts floor-to-ceiling windows an upscale restaurant a swanky lounge and concierge services. Rooms offer flat-panel TVs with premium cable custom-made velour robes and stone baths. Wi-Fi and wired high-speed internet access are available for an additional fee. The hotel offers a great workout in the gym plus a heated indoor pool and a hot tub. 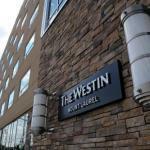 The Westin also provides a business center banquet facilities and wedding services. Pets are permitted (they even get their own bed) and parking is available both for free. The Westin is just over five miles to Funplex and five minutes by car to the Garden State Discovery Museum. Downtown Philadelphia with attractions such as the Liberty Bell and Independence Malls is 13 miles from the hotel. It's just over 23 miles to Philadelphia International Airport.